ShapeJS provides assistance in generating correct wall-thickness and manifold objects through per-voxel level control. Supports use of 2D Image data to be mapped onto 3D objects without compromising functional design. 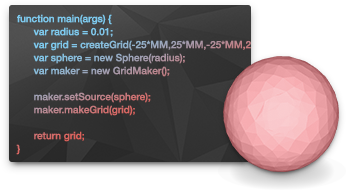 This overview will take you through generating 3D geometry using the ShapeJS language.